Going back to VMware, make sure to rescan your storage adapters and in some cases refresh. Once that it is done, you should now see that Hardware Acceleration is Supported! Nexenta has moved the link around a bit and I was curious as to what was in the vaaictl file, so I have included the output below. You can manually recreate the Python script by copying and pasting the output into a file. sys.stderr.write("Not all settings found when performing %s operation. " sys.stderr.write("Inconsistent settings found when performing %s operation. " Thanks for this post. I was stuck upgrading my nexenta lab to 4.0.4 until I realized the existing storage was created in ATS only mode. 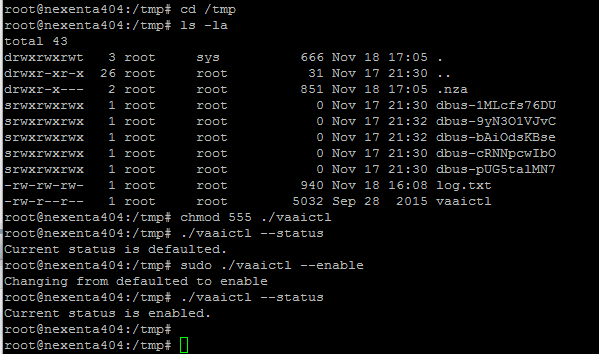 Adding the VAAI and rebooting my storage and esxi host solved the trouble. I was able to re-mount the existing datastore in place.